Three various Global Music acts will perform. Great bites to eat and wine. Visit the Pop-Up Art Spot and experience art in a new way. Learn how the repetition and overlapping of simple shapes creates intricate designs and patterns. Explore the cross-cultural connections in works of art from the Keir Collection and participate in a cultural exchange project with other visitors. Soody Sharifi is an American-Iranian artist who works with photography, painting, and collage to explore the experience of living between two distinct cultures. Join Sharifi for a talk about her painting Courtly Love, recently acquired by the Museum. 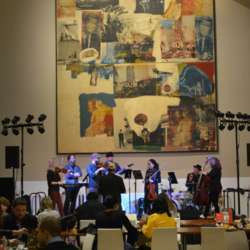 Listen to world music performed by Ehsan Matoori and musicians from the AramArt World Music & Art Institute. Matoori was born in Iran and at the age of 9 he began learning the santoor based on Maestro Faramarz Payvar’s method. AramArt is a cultural, educational, and entertainment center that offers a variety of services to the enthusiastic children and adults in the DFW area. Drop by the Tech Lab to meet calligrapher Elinor Aishah Holland and watch her create intricate works of art composed of Arabic script. At 8:30 p.m. Holland will give a brief artist talk about her work and the rich cultural history of Arabic calligraphy. Calligrapher Elinor Aishah Holland will talk about the history and artistry of Arabic calligraphy with examples of her own work. After the talk, visit the Keir Collection of Islamic Art to see more of this centuries-old artform. In the surprise box-office smash Kedi, director Ceyda Torun returns to her native Istanbul to capture her hometown from the perspective of seven of the city’s hundreds of thousands of stray cats. Torun crafts an infectious portrait full of charm and sweetness, at once a love letter to the regal animal and to the ancient city itself. This film is not rated Protected content , 79 minutes).